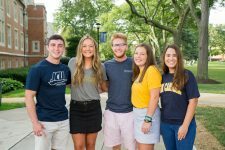 John Carroll offers an array of scholarships and financial aid for freshmen. If you are a United States citizen, make sure you complete the Free Application for Federal Student Aid (FAFSA) by the deadline to be considered. When you submit your application for admission, you’ll automatically be considered for merit scholarships up to $25,000, which are awarded based on your classroom performance, standardized test scores, and extracurricular involvement. John Carroll has three highly competitive signature programs inspired by our University Learning Goals. These programs come with an annual scholarship up to $5000 and require coursework and meaningful experiences. Students in these programs also have the opportunity to join the Signature Program Living-Learning Community and may receive additional funding for experiential learning, capstone completion, and books. John Carroll also has many donor and alumni-supported scholarships based on everything from degree to hometown. No separate application is required unless specified. Every accepted applicant who meets the criteria will be reviewed by the Financial Aid Committee. These funds are awarded to freshmen and are renewable for four years.